You can use the Cabinet Vision software provided to design your cabinet layout — However, it is not very user friendly, and more importantly, it does not generate an order list. In comparison, if you design an Ikea kitchen using Ikea’s software, you will end up with a list of everything you need to order. The Ikea program breaks down all the pieces (door, hinges, drawers, cabinet frame, etc) needed for each cabinet and creates a detailed list of everything you need to buy, and it includes the prices. The Cabinet Vision software used by Barker does not do any of that, so I didn’t use it. The lead time is listed at the top of the home page. It’s currently 40-45 business days with an additional 5-10 if you want them painted or stained. Mine took even longer than the estimate. Any questions you have should be directed to the owner, Chad Barker at info@barkercabinets.com. He responds personally and rather quickly. You also can search the Barker Forum for answers and ideas, but like most forums it’s pretty annoying and disorganized. It is also highly administered (censored) so don’t expect to get a lot of honest feedback on here. But it is a good place to find pictures of finished kitchens. There is a section of Before and After pictures on Barker’s website which gives you an idea of what the finished product can look like. Just remember these are kitchens that Chad selects as the best. The Anderson Project was especially helpful for me because the kitchen layout is nearly identical to mine. Definitely have any diagrams, sketches, elevations, etc in front of you as you are placing your order. You’ll need to make a few decisions regarding finish and upgrades. You can choose your door style as well as the species of wood and the finish. The only paint colors offered are “pure white” and “dover white.” I was too lazy to order a sample to see if the white would work, plus I wasn’t sure I wanted all white anyway. So I just decided to paint the doors myself. Be forewarned — If you order painted doors Barker will use white edge banding on the cabinet frames. I hate this look. Since I ordered unfinished doors, my cabinets came with unfinished wood veneer edge banding, which I covered with two coats of polyacrylic. I’m assuming that if you want painted doors with natural wood edge banding that Barker Cabinets will do this for you. I would just email Chad about it ahead of time. I went with Chad’s recommendation and upgraded to the maple panel/maple frame for my shaker cabinets. He said there was a pretty noticeable quality difference. Don’t forget to order end panels, toe skins (to cover toe kicks), crown molding and whatever other finishing touches your design calls for. After you’ve entered the entire order, print it out before submitting it and go over every little detail. Have someone else check over your order one last time before submitting. Armed with my sketches, I sat down at my computer to order my cabinets. I broke my design up in two sections: (1) the lower cabinets in the shape of an L and (2) the wall of floor to ceiling cabinets aka the pantry wall. I drew yet another sketch before I started the order. A very simple sketch with basic measurements. From this very simple sketch, I knew I had 6 cabinets to order, and that two of the six were identical. There are also 2 end panels and toe skins to order. Working left to right, the first cabinet is the sink base cabinet. You will see all the categories for base cabinets. We ares starting with the sink because it is the first one on the left of my drawing. Within the sink category, there are 8 options. 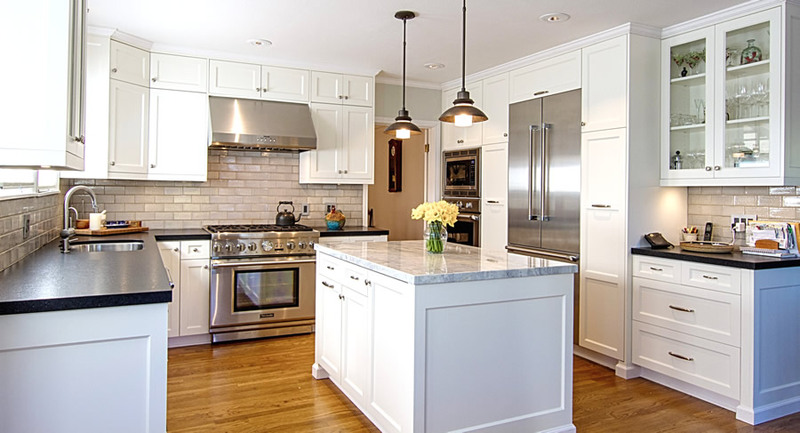 One door, 2 doors, full height, drawer on top or bottom, or farmhouse sink options. I wanted full height with two doors. This is the awesome (and scary) part — After you select the type of cabinet you want (2-door, full height sink base cabinet), there are still 10 additional selections to make. That’s fantastic from a customization standpoint, but totally overwhelming from a design/DIY standpoint. It is not difficult, you just have to pay attention! The two areas you will probably leave alone are the height and depth. These default to the standard cabinet measurements of 34.5″ tall (because counters are usually 1.5″) and 24″ deep, which is also the depth of your appliances. The width of a sink base cabinet depends on, you guessed it, your sink. You should have worked out the measurements during the planning phase because right now certainly is not the time for that. I wanted a beast of a sink, so my sink cabinet is 3 feet wide. You can see below that making the cabinet this wide will add $70 to the price. Every .25″ has its own price! The next choice is door style. The standard (no additional charge) is shaker inset panel. Lucky for me, that is exactly what I wanted! You can click on the pictures or on the drop down menu. Selecting one will automatically change the other. Clicking on the small pictures will bring up a bigger picture on the left. Barker has a very nice selection of door styles, which makes sense because their company began as a cabinet door company. You’ve selected your door style, so now it’s time to select the wood (or go with MDF). I went for an upgrade here and selected the maple panel and frame, as opposed to the lower priced MDF. You can see below that it cost me an additional $28. This might not seem like much, but remember there will be an upgrade for each cabinet and the cost varies depending on how many doors/drawer fronts are involved. Once you’ve selected your wood, you need to decide if you want Barker to apply a professional finish. I told you earlier that the only paint options are pure white or dover white, but there are also several options for clear protective coatings. The photos and details for these options are not on the ordering page, but can be found under Wood Types and Finishes. I went with unfinished because I knew I wanted my cabinets painted, I just didn’t know what color yet. Paint and varnish not only cost more, but they can add an additional 10 days for delivery. Dude, I’m impatient enough as it is! The next option is just an optional drawer. I like the idea of a pull out drawer in the bottom of a sink cabinet, but then again I don’t. It would not work unless your plumbing came out of the wall and cleared the drawer. The plumping for my sink comes from below the cabinet and straight up the middle of the cabinet bottom. A drawer would not have worked. So check your plumbing before considering this option. Last, but not least, is the toe kick option. When it doubt go with standard, like I did here. There may be an instance where you want your cabinets to come with no toe kick, because you are going to build your own. This is more common on a kitchen island. If you like the idea of base molding on the front of your cabinets (not recommended if you are going to stand at them), then you might want to order the flush toe kick. Flush toe kicks make more sense on pantry-type cabinets. That’s it! Hit add to cart and this is what the order will see in your cart. Easy, right!?! Yes. But the bad news is that was only one of many cabinets. Check out the next post to see how I finished ordering the Barker Cabinets for this section of my kitchen. Check out this post to see how I ordered cabinets for the other section, the pantry wall. Be sure to save this post for later! What was your total cost for the order? Just a note to help any others who are thinking of using Barker cabinets. We did order painted cabinets from Barker and had emailed Chad Barker before doing so about getting the raw wood banding instead of the PVC banding. He said it was possible but he would prefer not to. Something about possible production issues. After placing the order we received word that it wasn’t possible. After showing the original response from Chad, we were told they would not do it but we could pay for the wood banding and remove the PVC one and put on the wood banding ourselves. I then responed to Chad with what we were being told now. He said he would go ahead and do it, but I could tell from the tone, he was not happy about it. The responses were very quick, so I really appreciate that, but I would NOT suggest trying to change the banding. They seem very particular about following a certain process and don’t want to deviate from it. Not that that is bad, but it does make the company more intimidating to work with. Thanks for the info! It does seem weird right, because they are custom ordered? It would probably be easiest to just pay someone to paint the doors white after you receive them if you weren’t interested in painting them yourself. I have your cabinet doors installed, but after years of use the cabinet sliding door hinges have broken. I need to replace them and can not find where to buy them and hope you can help me. These 2 pieces are snap connected together and came apart. The back piece broke where the screw belongs . Can I purchase these pieces from you or can you please tell me where I may be able to buy these pieces. The ones Home Depot have are larger then these. The doors to the laundry open out and slide back on the inside wall on a track along the sides of the machines. I must have this same size. I need at least 4 of the sets. If I can purchase them from you please advise me or tell me where I can find them.